You may never know everything there is to know about reading tea leaves, but you can certainly learn enough to have great results and a lot of fun. No one is really sure what makes tea leaf reading a powerful method for revealing the future, past, and present. Some say the person being read for influences the tea when drinking it. Others claim it is a form of psychometry – a psychic ability where you gain information from inanimate objects through clairvoyance. But it doesn’t matter how it works. Just know that it does. Tea leaf reading began many centuries ago in Ancient China. It developed from tea drinkers interpreting the shapes that tea leaves left in the bottom of their cups, evolving into a method of fortunetelling. When tea was introduced to Europe in the 1600s, it became a fashionable and popular drink. The art of reading tea leaves became quite popular in Europe as well. It was one of the easiest forms of fortunetelling to practice as it only required tea, a cup, and a saucer. There are many types of tea. However, loose tea – green, black, white, or oolong – is the best tea for tea leaf reading. The tea leaves in tea bags are too broken down in processing to easily read tea leaves. If you’re desperate, you could open a tea bag and use its contents for a tea leaf reading. But you’re much better off using loose tea because the images are clearer and easier-to-read. Just as tea bags have tea leaves that are too small to read, you also want to avoid teas that have really large leaves, like gunpowder green tea. The leaves will cover the inside of the cup and you won’t be able to interpret images. The leaves don’t need to be the same size. In fact, ones that are slightly different in size and shape (like Keemun) work well because of how they will form images in your cup. Some tea leaf readers state that you shouldn’t use tea that contains added ingredients, like dried flowers or orange peel. I have read tea leaves using tea with these ingredients and haven’t had a problem. You just want to make sure that the flowers and peels are a similar size to the tea leaves so that they’ll blend in well, acting similar to the tea leaves in creating images. You can read tea leaves using any cup – from the oldest to the newest. Just make sure it is nicely rounded and has a handle. You can use a special tea set if you’d like, either an antique or a new one. The same goes with teapots. You will need a saucer. If you have one that matches your cup, that’s great. If you don’t, it’s okay. You just need something that can catch drips when you turn the cup upside down. A small plate can work in place of a saucer. You’ll probably want to use a tea cup and saucer you enjoy. The same with a teapot. Teacups and teapots come in a variety of shapes, sizes, colors, and designs. You might have the perfect cup, saucer, teapot or tea set in your cupboard already. If not, you might find it in a local department store, a flea market, or antique shop. Handmade is a great place to find handcrafted, artisanal, and fair trade tea items from around the world. When it comes to teapots, do keep in mind that you don’t want one with an internal strainer that prevents the leaves from leaving the pot and going into your cup. Any type of design that catches or strains the leaves isn’t suitable for tea leaf reading. Choose one that allows the leaves to flow freely into the cup. The same applies to all types of tea strainers. They are not used in tea leaf reading. You want leaves in the cup of tea – they are essential to reading tea leaves. Don’t worry that you might swallow them. They’ll settle to the bottom and you’ll leave a bit of tea (and the leaves) in the cup when you’re done drinking. If you happen to swallow a few tea leaves, they won’t hurt you. They’re quite edible. It’s okay if you add milk, lemon or sweetener to your tea. It won’t affect the tea leaf reading. However, you shouldn’t add cream to tea. It will give it an unpleasant flavor and texture. 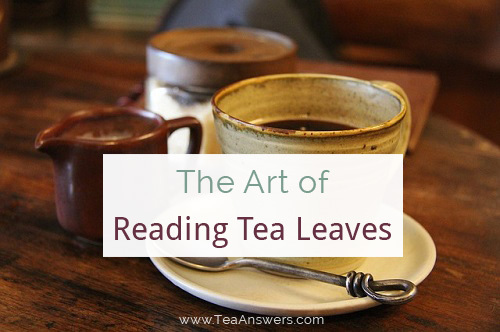 The high fat content can also cause the tea leaves to clump together making it hard to do a reading. You can find detailed instructions on how to make all types of loose tea here: How to Make Loose Tea. Just skip the bit about straining tea before drinking in step 6. For tea leaf readings, you want the tea left unstrained. It’s important that tea leaves do end up in your cup. That covers all the basics and essential elements involved in tea leaf readings. NEXT ARTICLE: In the next article, I cover the actual ritual of reading tea leaves. You can read it here: How to Read Tea Leaves. Luz – I’m glad I could help you with your research on reading tea leaves. My great grandmother ( from Scotland) would read tea leaves. I’ve never seen anyone since her to do that. How wonderful you were able to watch her read tea leaves! It is rare to see someone do it nowadays. Hopefully, we’ll see more tea leaf readers in the years to come.